Imperial Car Supermarkets are commited to delivering the very best service to all of our customers. 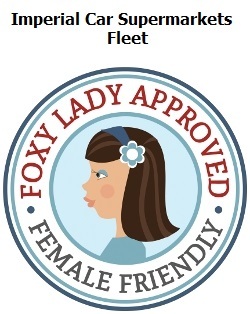 Recently we have been 'Foxy Lady Approved' by The Foxy Lady Drivers Club at www.foxychoice.com . This is an organisation, that highlights female friendly garages and car dealerships; and is supported by the IMI Professional Register of Tested, Trusted, Approved Motor Industry Professionals. The Imperial Car Supermarkets mission is to never overcharge, patronise or sell services that our customers don't need at our used car showrooms and car service centre. This qualifies us to become part of the Foxy Lady Approved network. So, if you are looking for a female friendly garage, look no further than Imperial Car Supermarkets. With us, you can be sure of great customer service, high quality, great value cars and top notch servicing.